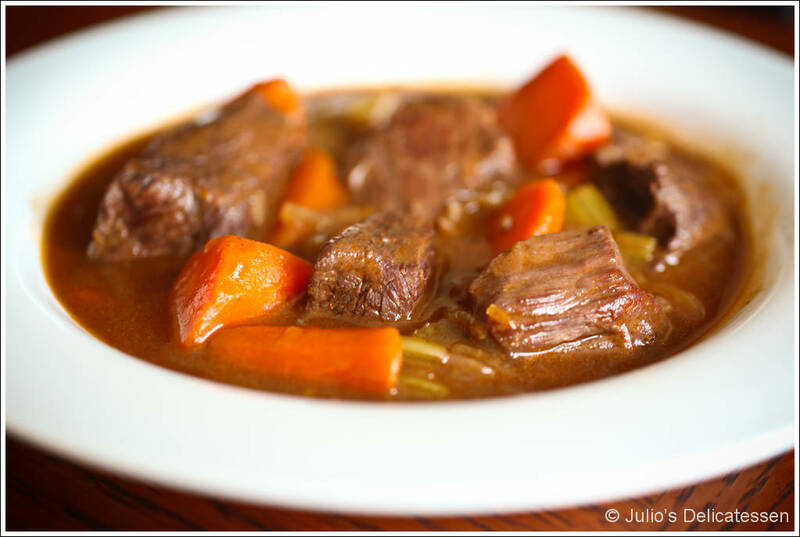 This dish isn’t significantly different than Beef Bourguignon which is my cold-weather, large-group, make-ahead standard, but the orange zest and the extra vegetables are a nice twist on that recipe. If you make this a day in advance, refrigerate overnight, and reheat (in a low oven) the next day, it will be even better. In fact, I just finished making this a few minutes ago, took the photo above, and will be refrigerating it overnight so it will be ready to go for tomorrow’s Colts playoff game. 3 hours, 30 minutes before you want to eat – Preheat the oven to 300. Cut a parchment lid that fits the pot you plan to use. Dry the meat with paper towels. Season liberally on all sides with the salt and pepper. Heat some canola oil in a large Dutch oven. Brown the meat on all sides, working in batches if necessary. Remove the meat from the pot and set aside on a plate. 3 hours before you want to eat – add the onion, carrot, and celery to the pot. As the vegetables begin to soften, use your spoon to get all of the fond off the bottom of the pot. When the vegetables are soft (about 8 minutes), add the garlic. Cook for 1 minute. Add the tomato paste and stir for about a minute. Add the flour and stir to combine for another minute. Add the wine, using your spoon to scrape all of the fond off the bottom of the pot and combine everything. Bring to a simmer and reduce by half (about 5 minutes). Add the remaining ingredients and the browned meat (along with any liquid that has accumulated on the plate). Add enough water to nearly cover the meat. Bring to a simmer. 2 hours, 35 minutes before you want to eat – cover the pot with the parchment lid and place in the oven for 2.5 hours, stirring every 30 minutes. 5 minutes before you want to eat – remove from the oven, test to make sure the meat is very tender and adjust seasoning. Discard the boquet garni. Serve with egg noodles.